In order to investigate the scale-selective influence of SGS on the large scale dynamics, DNS and LES are performed for the Taylor-Green vortex problem. An a priori analysis confirms the interest of the hyperviscous feature at small scale as used in implicit LES, SVV and VMS. However, the assumption of zero SGS dissipation at very large scales is found unrealistic for the high Reynolds number and coarse LES mesh considered. A posteriori analysis shows that SGS modelling based on the assumption of an inviscid cascade leads to a bottleneck effect on the kinetic energy spectrum with a significant underprediction of the total SGS dissipation. 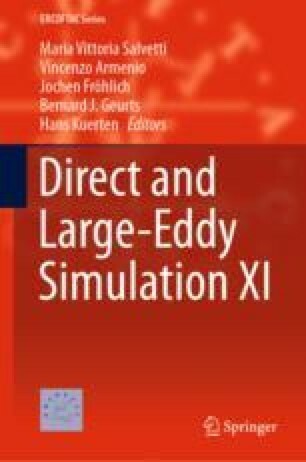 The simple addition of a constant eddy viscosity, even targeted to be optimal in terms of SGS dissipation, is unable to give realistic results. To allow accurate predictions by LES, a specific closure that incorporates both the hyperviscous feature (i.e. regularisation) and the expected SGS dissipation at large scales has to be developed. This work was granted access to the HPC resources of TGCC under the allocation 2014/2015/2016-2a0912 made by GENCI.